This easy fruitcake recipe is full of pecans, candied pineapple, candied cherries, dates, and just enough batter to hold it all together. It is moist and sticky – more like a candy than a cake in a lot of ways. It’s a traditional fruitcake with old fashioned flavor and it’s been a family favorite for generations. I grew up loving fruitcake. To be honest, I could never figure out why people didn’t like it. To me, there was nothing more delicious than a piece of my Mom’s fruitcake – moist, chewy, and candy-like; thickly slathered with cream cheese or butter. Even better if it was sitting next to a cup of hot chocolate. Mmmmm – Christmas! That is, I didn’t understand it until the fateful day when I tasted someone ELSE’S fruitcake. EWWWW! I finally understood the jokes..the grimaces..the gagging. Right then I felt sorry for anyone who wasn’t me, who didn’t have access to this amazing stuff. I mean, how could it be Christmas without it? I have no clue where my mom got the recipe but she made it for her 6 siblings every single year. Numerous fruitcakes were wrapped in waxed paper, then boxed, then covered with brown postal paper and tied with a string just after Thanksgiving just like clockwork. My job was holding my finger on the string so Mom could make the knot tight. It was mailed overseas to my uncles during World War 2… it has been mailed overseas to my kids in the military. I’m telling you… it’s unbelievable… and it’s a tradition. You can make in November and let it sit in a cool place or make it closer to Christmas..either way it will be great. How do you make a fruit cake in the oven? This fruitcake recipe bakes slowly in a slow oven which helps keep it moist and delicious. A pan of boiling water is also added to the oven to create steam during the baking process. Fruitcake is high in calories and sugar so you probably shouldn’t make a habit of having it for breakfast. Generally it’s considered a holiday treat so whether or not it’s healthy isn’t usually a concern. How do you keep fruit cake moist? 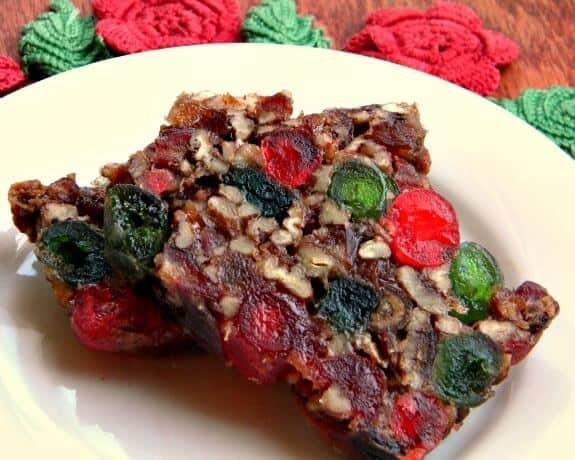 This traditional fruitcake recipe is moist because of the baking technique and we’ve eaten the last few bites of it a month or so after making it – it’s not dry. Just keep it wrapped. Some people wrap it in a cheesecloth that’s been soaked in rum or brandy – and that’s a good way to ensure it doesn’t mold if you are storing it at room temperature for a long time. Why does my fruitcake crumble? The butter and sugar must both be present in the correct ratio to keep a fruitcake just right. If you use too much sugar or don’t cream the butter and sugar together sufficiently the cake may be crumbly. In THIS fruitcake there isn’t enough batter to require that ratio – there’s no butter because the candied fruit to batter ratio is so high that it’s more like candy. How long does a fruitcake last? A fruitcake that’s stored properly can last for years – not at our house though because we eat it long before it has a chance to go bad. Does fruitcake have to be refrigerated? Fruitcake will last a month or so at room temperature if it’s properly wrapped. It will also keep for up to about 6 months in the refrigerator. How do you store a fruitcake? Let the cake cool and remove it from the pan. Leave the waxed paper on it and then wrap it in plastic wrap, then foil. Not much difference in the look whether it is baked or unbaked! 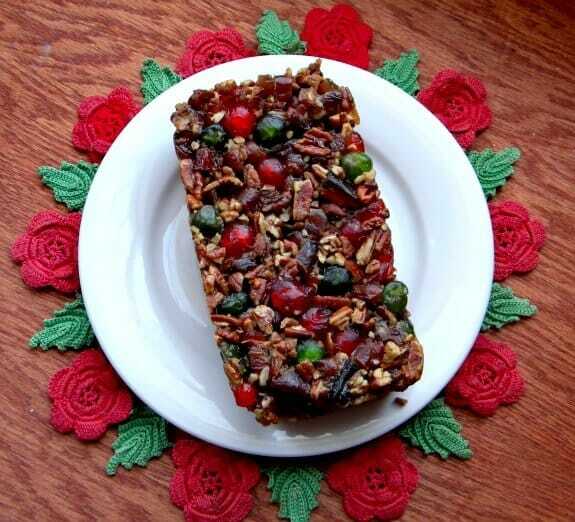 Why Is Fruitcake a Christmas Tradition? Fruitcake dates to ancient times when the Romans ate a satura cake, a mixture of barley mash, raisins, nuts, pomegranate, and wine. Overtime it evolved into fruitcake – with the candied fruit added to help preserve the finished cake during a season when fruit was not normally available. It was popular in Victorian England, where it was called a “Christmas Cake” and the tradition was brought to the United States. Fruitcakes were used as wedding cakes during Victorian times, as a matter of fact, partly because they could be made well ahead of time. I use these Pyrex glass loaf pans for all of my bread baking whether I’m making yeast bread, quick breads, or loaf cakes like this fruitcake recipe. I love that they’re easy to clean and last forever. If you are looking for the best fruitcake recipe ever this traditional family recipe definitely gets my vote. 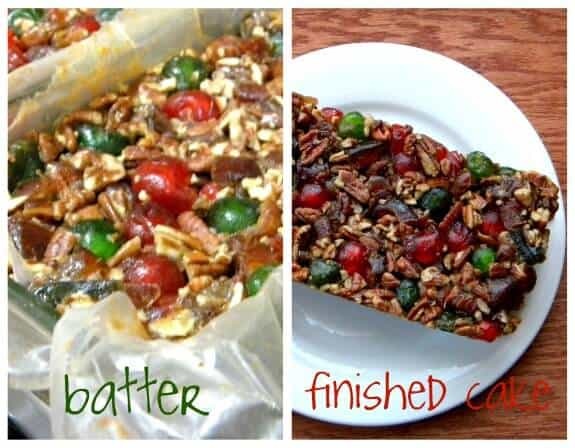 Try this fruitcake recipe at least once! I think you’ll like it. If you’re looking for a more “cakey” fruitcake give this Brandied Fruitcake with dried fruit from Country Cleaver a try. 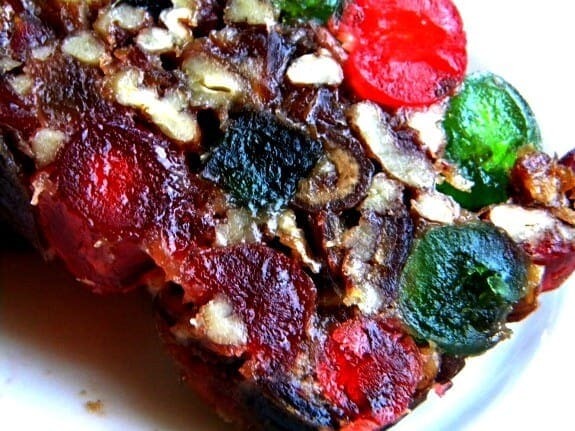 This easy fruitcake recipe has been in our family for years. It's full of dates, cherries, pineapple, and pecans that make it more like candy than a cake! No need to let it "ripen" it's great the same day it's made! Place a pan with boiling water in the oven to create steam. Fill the pan as needed during baking. Spray two loaf pans with cooking spray and line with wax paper. Spray wax paper with cooking spray. Sift dry ingredients over fruit and nuts and mix in. Spoon into prepared pans, pressing down gently to remove large air bubbles and spaces. Bake at 250 for 1 hour and 45 minutes. Part of the Meal Plan Monday #92 Link Up! I thought I left a review earlier but I couldn’t find it but that’s just as well because I’m changing it. At first I thought it was too sweet but really this recipe is perfect! The only thing I did differently was I added both vanilla and bourbon plus I made 3 cakes using the medium throwaway pans from Walmart. The best fruitcake I have ever had! Bravo! Could I pull this off in a bunt pan instead of to loaves? I have a feeling this has been the recipe I’ve been looking for!! Thank you! I’ve never made it that way so I am not sure. I just had a piece of this fruitcake and loved the texture of it! Lots of nuts and more like candy. But to be honest it was too sweet for me. I would cut the sugar by half next time or maybe even leave it out completely. Still good though! Hi Maryellen, made your recipe and it IS the best fruitcake ever. Loved your fruitcake history with momsending it during WW2 to her siblings and history of fruitcake. I do have question? When I went to take wax paper off fruit cake to cut it was sticking. I did remove it all. Should I wrap 2nd loaf in wax paper and foil to store and should I spray wax paper with cooking spray? Thank you again for sharing your mom’s recipe, I feel like I hit the lottery with this recipe. Merry Christmas to you and your family.